Sometimes we decide to change our lives for better too late. Mary has been struggling with obesity since she was a teen, her twin sister Ruth and her son’s concern about her health were not persuasive enough to start eating healthy. Until one day, a tragedy came to Mary’s door. Twin sisters Mary and Ruth appeared on the Oprah show, sharing their story. 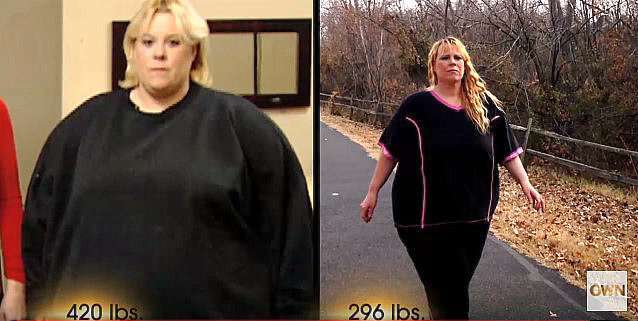 Back then Mary had weighed 420 pounds when her sister had 120 pounds. Before they were 10, girls looked exactly the same, but later something changed, and Mary lost control over eating. Ruth was ashamed of her twin, who could not fit in the chair in the hairdressing salon. It was hard to get her in and out of the car. Mary’s son Chris had never told mom how he felt, but on the show, he revealed his feelings. The boy was in tears, sharing his fear of losing his mother. He said, she made him angry when ordering a large portion of fast food, and eat that all just in few bites. That stroke Mary, but not hard enough to make changes anyway. But a few years later Chris died in the car accident. Mary was shocked and heartbroken and for more than a year could not cope with depression. Then she realized, enough was enough. She must live how her son wanted her to. She started working out and eating healthy. That’s when her weight dropped and she could feel more comfortable in her own body. It is so sad, Mary realized she needed to step on the healthy path only after the horrible tragedy. Her son would have been proud of her now.